Heart Healthy, and Diabetic Friendly Treat Just for You! Many diabetics shy away from fruit because they perceive it to be high in sugar and therefore likely to raise their blood-glucose levels. However, the American Diabetes Association encourages diabetics to include fruit as part of their diets because fruits, including strawberries, contain essential vitamins and minerals for good health. Pineapples are both juicy and fleshy with the stem serving as the fibrous core. They are generally harvested during the autumn season, with availability year round fresh. 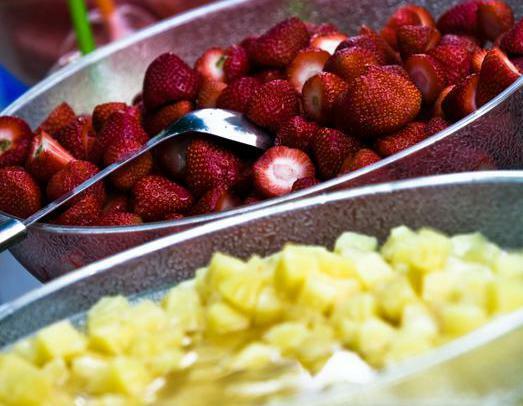 Pineapples are not only delicious to many, they contain several nutritional benefits such as: Fat free; saturated fat free; very low sodium; cholesterol free; high in vitamin C.
Strawberries can be part of a balanced diabetic diet, and they may even provide specific health benefits for diabetics. According to research reported in the April 2010 issue of “The British Journal of Nutrition,” consuming strawberries and other berries may reduce the body’s overall glucose response after a meal. You can regulate your blood sugar level by adding coconut fiber to your diet. Coconut fiber is in the meat of the coconut. Blend 1 cup of young coconut meat with 3 cups of pineapple (using a Vitamix is ideal for that creamy consistency but a regular food processor works as well) and place at the bottom of your glass. Sprinkle with pineapple chunks on top. Blend the other cup of young coconut meat with 3 cups of strawberries and place on top of the layered pineapple cream and pineapple chunks. For the finish, top it off with the remaining cup of sliced strawberries. A healthy lifestyle is pivotal to living well with diabetes. Nourishment, and a healthy balanced diet plays a important part in that process. By Fight Diabetes Now in Healthy Recipes, Uncategorized on November 5, 2015 . Artificial Pancreas Filed for Approval in the U.S.